I could hardly wait to get to these shoes. I promised myself I could paint them after I did the paintings of the flowers. These shoes are my reward for painting the flowers before they passed on. 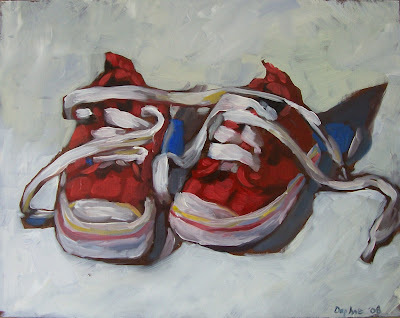 I loved painting my daughters tiny red shoes. I like how over sized the laces are. I had to really hold back from getting too intense on the details. I did this by using larger brushes so I couldn't get too finicky. I have been posting my work usually the day after the work is completed because I need the drying time so I can put my signature on without it turning into an unsightly, illegible, blob of paint. So, I go through my day anxious to post my newest work. I love posting my work and sending it out there to the abyss to see what will happen or if anything will happen at all. I love it. Beautiful colors in the shadows. excellent value ranges in the red of the shoes. And the fluid brush strokes, captivating! Love this one.